It is vital to opt for a face moisturizer that will replenish and hydrate your skin. 1. Clinique moisture surge intense plumps your skin with 24-hour hydration, instantly rehydrating skin while helping to repair its moisture barrier over time. Use twice a day, morning and night. 2. Born from the sea, the legendary Creme de la Mer has the power to transform the skin, rejuvenating and renewing even the driest complexions. Anyone who wants to quickly improve firmness and reduce the appearance of lines, wrinkles and the look of pores for skin that appears virtually ageless. 3. Fresh vitamin nectar moisture glow face cream is revitalizing moisturizer that awakens dull skin for an incredibly vibrant, healthy-looking glow. This moisturizer is for anyone with normal, oily or combination skin types. It formulated with a vitamin fruit complex; this revitalizing universal moisturizer instantly awakens skin for an incredibly vibrant, healthy-looking glow. 4. Kiehl's ultra facial cream is a 24-hour, light-textured daily hydration that leaves skin comfortable and visibly well-balanced, particularly in harsh weather conditions, providing continuous moisture replenishment throughout the day for a complexion that is smoother and more healthy-looking. 5. Bobbi Brown Hydrating Face Cream is a rich yet lightweight formula that instantly hydrates and steadily releases moisture, skin conditioners, and nutrients throughout the day and is ideal for layering under makeup. 6. Youth to the people kale + spinach green is a multifunctional, lightweight face cream loaded with superfoods including kale, spinach, and green tea plus hyaluronic acid to moisturize the skin. 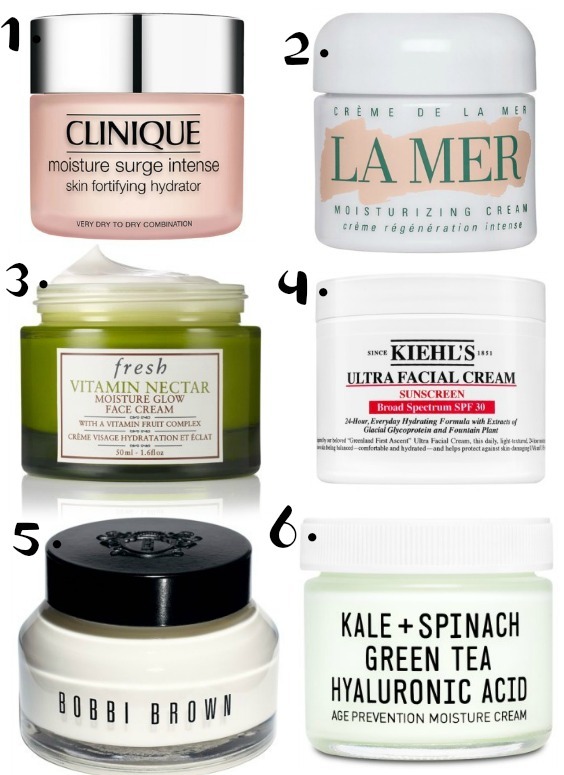 Do you have a favorite face moisturizer?